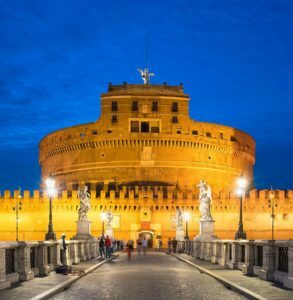 Castel Sant’Angelo in Rome has opened previously closed-off spaces, including a series of three rooms known as the Cambellotti Rooms, to the public for the first time, and is also providing new ways for visitors to interact with and understand the historic monument. “Cambellotti, who was known as a master of sinuous and floral design, decided on this occasion to try his hand at military themes,” Lazio Region Museums Director Edith Gabrielli told ANSA. Castel Sant’Angelo was built in 139 AD on the banks of the Tiber River as a mausoleum for Emperor Hadrian and his family. The massive cylindrical monument subsequently served several purposes over the centuries. Gabrielli hopes the newly opened spaces will give visitors a more comprehensive look at the castle’s varied history. “It’s very difficult to explain the castle’s historic stratification, starting from its origins as the Mausoleum of Hadrian, then a fortress, then a Renaissance-era papal residence, then a prison and a torture chamber, and now, a museum,” Gabrielli said. Parts of the castle that were already open to the public include the burial chamber where Hadrian’s ashes are kept, the papal apartments, the prison, and the Angel Terrace, which provides great views of Rome. While walking through Castel Sant’Angelo, visitors can use a smartphone app as a personal audio guide to learn about different parts of the castle. The app, which works with the Wi-Fi in the monument, communicates with eBeacons throughout the museum to automatically deliver audio and multimedia content about nearby features. The app, simply called Museo Nazionale di Castel Sant’Angelo, is available in seven languages for Android and Apple devices.